Supports MS Excel 2019/ 2016/ 2013/ 2010/ 2007/ 2003/ XP/ 2000/ 97/ 95 versions. I would have lost all my important spreadsheets if my friend hadn’t have recommended me Kernel for Excel. I am happy with the precise results I got by using this tool. Not a single cell was affected in the recovery process. Thank you for such a great tool! Kernel for Excel surprised with its powerful performance. The Multiple File mode helped me recover my Excel files as per my preferences. Special thanks to the technical support team who answered all the queries so patiently and helped me in making an informed purchase. The tool is super-quick in restoring data. To be very upfront, I wasn’t expecting such a smooth experience, but the tool worked well. I found Kernel for Excel Repair a reliable software in real terms. Thank you to the Kernel support team. Are you unable to open Excel Workbook? With this fantastic Repair software, you can retrieve data from the following Excel files. 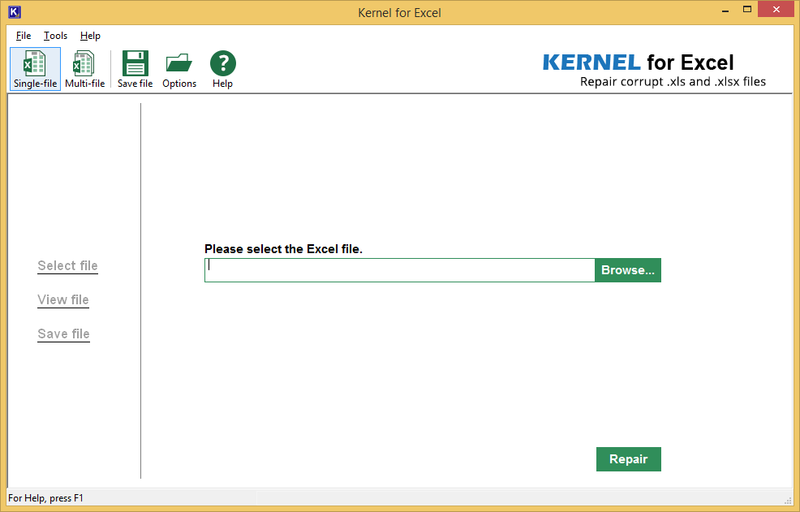 What can you recover with Kernel MS Excel Repair Tool? 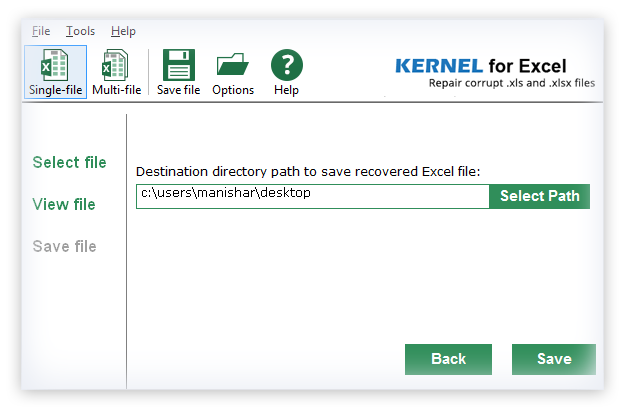 Kernel for Excel Repair is recognized as one of the most reputed tools for recovering corrupt Excel files. It allows you to simply upload the corrupt Excel files and repair them in the simplest manner. You can retrieve the following items of a damaged Excel file with Kernel Excel Repair. Pivot chart, pie chart, etc. With Kernel for Excel Repair, you can also preview the repaired Excel file in the same format as they were available in the original document. Kernel for Excel is a quick XLS repair solution for you when you get error messages in Excel and fail to open Excel files. Whether you face corruption in a single worksheet or entire workbook, this smart utility performs Excel document recovery with accuracy. Additionally, it deals with the Excel errors that occur due to file header corruption, round tripping, abrupt system shutdowns, application exit errors, and virus intrusions. This Excel repair tool is supported with powerful QFSCI algorithms which helps in quick extraction of XLS as well as XLSX files regardless of their size. It restores every bit of data from corrupted excel file(s) including OLE objects, fields, forms, reports, headers, footnotes and hyperlinks contained in them with utmost accuracy and ease. It offers extensive support towards UNICODE character recovery as well. This intelligent solution for Excel file repair comprises two recovery modes, namely; Single File Mode and Multiple File Mode, to recover one or more XLS/XLSX files in a single attempt. With Multiple File mode, the user can take advantage of various options that are available for saving number, formula, book value, text, merged cells, row information and column information. Simply, Excel recovery is made effortless! This Excel repair solution ensures zero harm to the integrity of data contained in Excel file(s), no matter how severely damaged or how big the file is. It retains the original formatting, structure, and properties of the file to maintain consistency in the recovered files. To be precise, it restores exact an replica of the original file without any change to the cells, worksheets, and workbooks. Before saving, this advanced Excel repair tool allows you to review entire data through the smart preview technology embedded into it, before saving it. The Software displays file contents in a spreadsheet format. Using its LIVE preview function, you can verify the recovered Excel file after the XLS file recovery. Integrated with advanced features, this XLS/XLSX file recovery tool isn’t difficult to operate. In fact, it has a clear and friendly interface that offers you maximum ease at dealing with error in Excel files, that too; without any technical training. SelectClick the Repair button after selecting the corrupt Excel file (the screenshot is for Single-file mode). PreviewIn this step, you can have the preview of the recovered Excel file. (Screenshot is for Single-file mode). SaveIn this step, click the Save button to save the repaired file in the required location. After saving the file, the software will display a link to the location (screenshot is for Single-file mode). 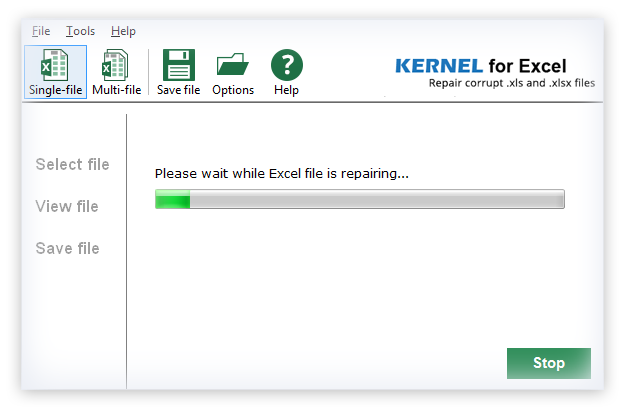 How to repair corrupt Excel file(s) using Kernel for Excel Repair? 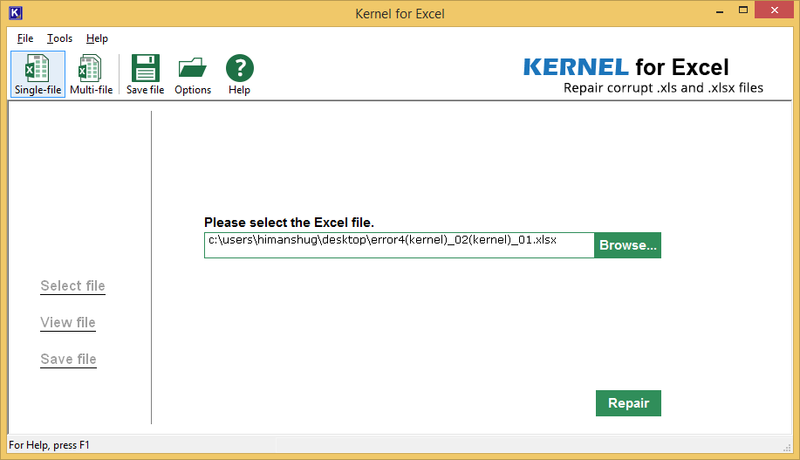 Download, Install and Launch the software Kernel for Excel Repair. Load Single or Multiple Excel files and use the Select File button to select the corrupt Excel file. Click Repair button and click Browse button to choose destination path as desired. Click Save and your Excel files will be saved to the mentioned destination. Is the tool capable of repairing original properties and structure of Excel file data? Yes, the tool is designed with the use of advanced algorithms that repair and save the original data structure and properties. Whenever I try to open my spreadsheet, an error pops up on my screen saying "Excel cannot open the file ****.xlsx because the file format for the file extension is not valid. Verify that the file has not been corrupted and that the file extension matches the format of the file.". How can your tool help? MS Excel usually shows such error messages when your files get corrupt or when there are some compatibility issues. Kernel for Excel can help you to fix this issue. Moreover, you don’t need any technical training to operate the Excel Repair tool and get your XLS/XLSX files back. Excel is my all-time favorite application at work as I store all the business-related data in it. It was all smooth till I lost access to my Excel files abruptly. Neither I am a technical expert nor having any technical expert by my side for help. Will your tool be helpful for a person like me? Definitely! 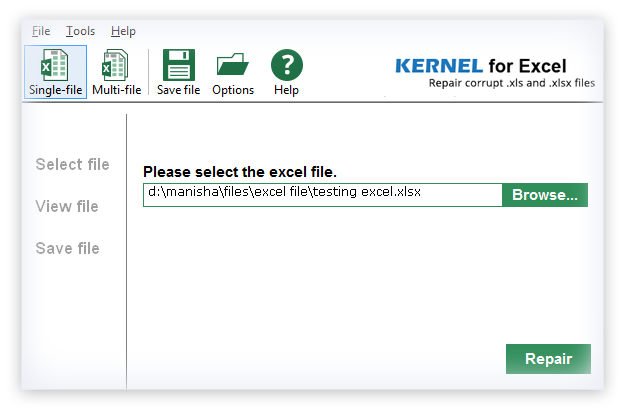 Kernel for Excel can help you repair corrupt Excel files even if you are not a technically sound person. This tool is designed with a straightforward and friendly interface that will assist you as you go. You will not find any difficulty in operating it. However, our tool comes with a help manual and user guide for a detailed description of every menu and tab integrated with the tool. What is the purpose of dual recovery modes in Kernel for Excel? How they differ from each other? Kernel for Excel possesses dual recovery modes including Single-file mode and Multi-file mode. The Single-file mode, as the name suggests, helps with recovery of a single file. 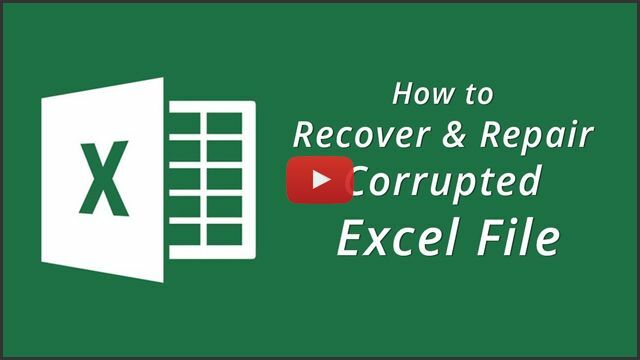 While Multi-file mode can help you recover 100s of corrupt Excel files in a single attempt. According to what your website says that your tool can recover corrupt excel files in three simple steps. Is it equally true for recovering too many files at a time? Yes! A Multiple file recovery mode is incorporated in the tool to serve recovery of many files in a single go. You just need to add all the corrupt files together and click on Repair and Save button. The tool will repair Excel file and save them at the location specified by you. Hence, you can repair any number of Excel files in three easy steps. I downloaded Kernel for Excel from your website. I can see my recovered files, but couldn’t save them on my system. What could be the problem? 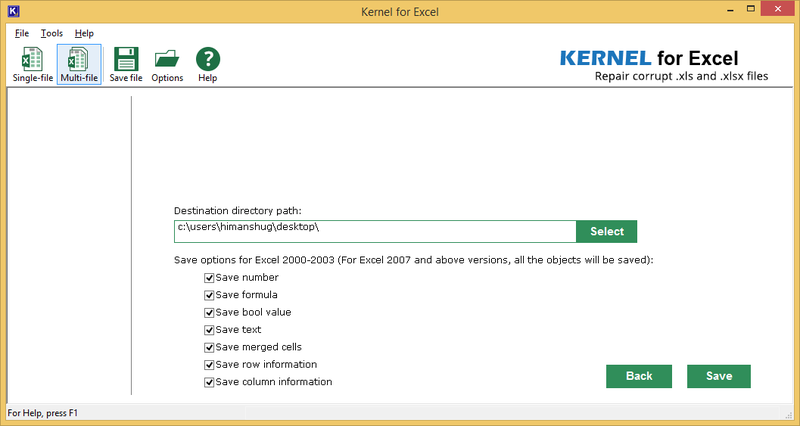 You might have downloaded the free trial version of Kernel for Excel. And now you can purchase the license to save the recovered Excel files. If you are facing any problem after purchasing the licensed version, you can contact our technical support personnel 24*7 over call, chat, or email. The software takes control of the data as soon as it starts working. Requires very less inputs. Impressed with the software features and user-friendly interface. To repair a single file, select the “Single-file” option and browse the file to repair. To recover multiple files, select the “Multi-file” option, and add Excel files. Select the Excel file saving destination and options as required. The progress of the Excel recovery process. After recovery, the tool will display the location of the Excel file(s). The outcome produced by the Kernel for Excel was outstanding as the software genuinely recovered the 23 MB sized Excel database containing the crucial age-old accounting records of the Doall Company. Kernel always prioritize its data recovery software with latest feature and updates. 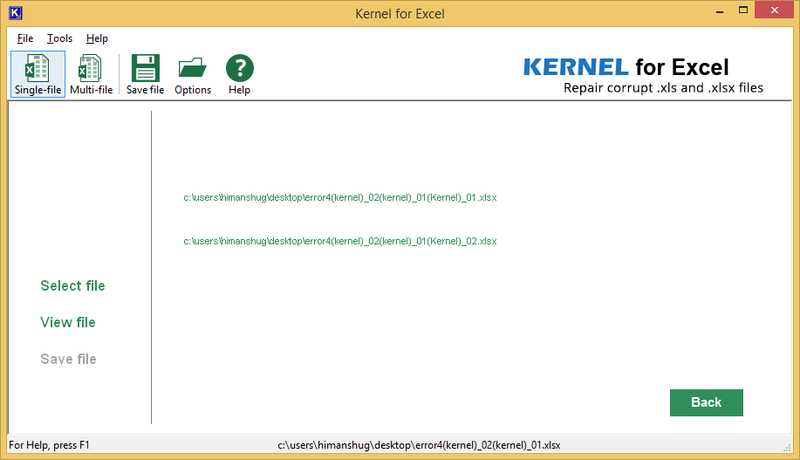 Now, it has updated Kernel for Excel Repair 18.10 with a new user-interface which is much more advanced & user-friendly. It also supports recovery of excel files from the latest MS Office 2019. It supports recovery of latest formulae and charts and brings them to you in full health. Kernel always updates its software based on the latest trends in the market. As MS Office 2019 is coming to the market shortly, Kernel has updated its Office-based tool - and Kernel for Excel Repair is one of them. Now it will repair the latest XLS and XLSX files. Also, Kernel for Excel Repair has been improved to recover formulae and charts even from Excel 2019. Updated version of Kernel for Excel is now eligible to deal with corrupt Excel files of MS Office 2016 and 2013 editions. 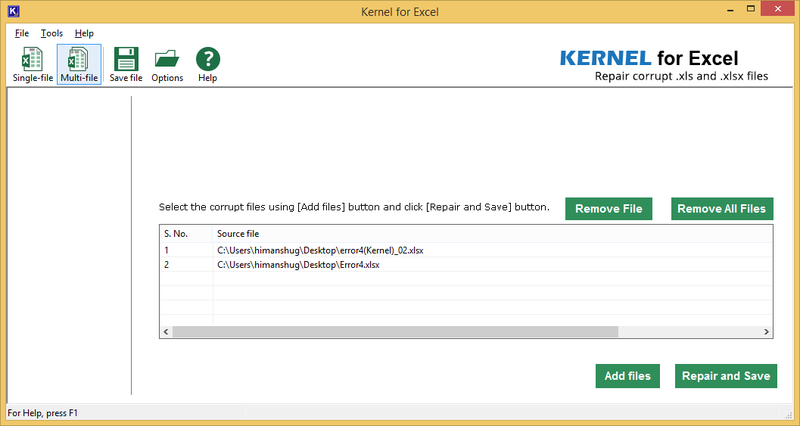 Updated version of Kernel for Excel can now be used to repair corrupt .xls and .xlsx files of MS Excel. The software is capable of repairing majorly damaged Excel files in less time and with complete accuracy. Multiple Excel files can now be repaired in single cycle with updated version of Kernel for Excel. 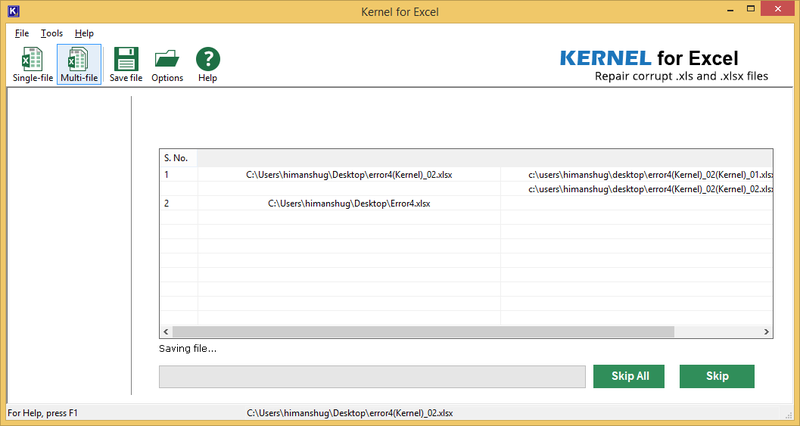 Kernel Excel Recovery Software updated version 7.05.01 is now on the stands. The new updated version of excel file repair software is more fast than its previous version. Minor bugs in the software have now been fixed, making it more effective excel file repair software. The corrupt excel files are now repaired more speedily and efficiently. Fixed bug where it used to show "Lost String". Fixed a bug in saving of recovered file. Supports recovery from New corruption types. Quickly fix corruption errors in MS Word files like .doc, .docx, .dot, .docm, etc. Quickly fixes all errors and corruption issues of PPT, PPTX , PPS, and PPSX files. Instantly repair and convert corrupt Access database files to healthy ones.